The county is set to launch an expanded facility that will process 57,000 tons of food waste and green waste a year. In 2013, Prince George’s County, Md., launched a food scraps compost pilot, and its work in this space took off from there. To keep up with demand for organic collections and the fertilizer the county now makes from that waste, it’s about to launch an expanded facility to process 57,000 tons per year of food waste and green waste. The facility will be the largest of its kind on the East Coast, according to Adam Ortiz, director of Prince George’s County Department of Environment. This expansion is part of the county’s zero waste initiative launched in spring 2018. 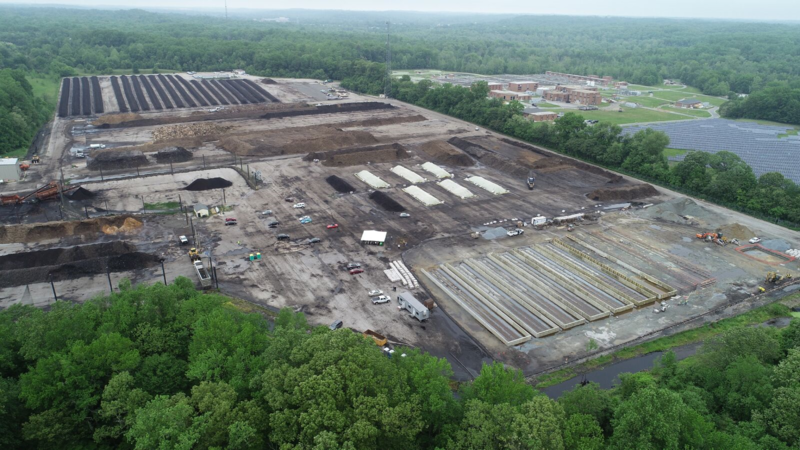 Run by Maryland Environmental Services under contract with the county, the expanded operation will utilize a 12-windrow SG Bunker system with GORE covers that features in-ground trenching for leachate capture and reuse. The system separates stormwater from leachate, prevents groundwater contamination and reduces odors and emissions, enabling the county to meet higher levels of compliance. Key to successful scaling is that the county did the research and came up with a plan before it started growing, says Scott Woods, CEO of Sustainable Generation, a clean technology composting company that provided Prince George’s County with its technology and operations guidance. “We’ve seen facilities that want to start out running and don’t have the details figured out yet. The county figured out the end-to-end process before it started scaling up,” he says. Predating the 2013 food scraps pilot, the county processed only yard waste, leveraging windrow turning technology that works well with that material but not with food waste. So, it moved to GORE covers, which is forced aeration, enabling it not only to handle food waste sustainably but to process in eight weeks versus eight months. When the county adopted the GORE technology, it started with a three-heap system and moved to a four-heap system, which enabled it to go to a continuous process versus batch. Within about a year and a half, the operation’s processing capacity doubled, which is now expanding beyond, says Woods. “We introduced the technology, but that was only part of what was needed. They had to develop and test the end-to-end process for food waste composting particularly, which involved working out source separation, the collection process and developing end markets,” he says. There’s been a lot of interest from local businesses, institutions and residents to divert their food scraps as well as purchase compost made from it. “For the county, it made all the sense in the world to continue expanding this operation because demand is overwhelming, and the economics are working well,” says Ortiz. The county sells $500,000 a year of compost made from waste that would otherwise be landfilled and subsidized by taxpayers. It also has a waiting list of 30 institutions and communities that want to bring food scraps from in and out of the county. One of the county’s clients is the University of Maryland, College Park campus. The university serves about 30,000 meals a day on that campus. Figuring out how to divert food waste has been a main focus since about 2010, when the university piloted a compost collection program. “We’d worked with smaller hauling and compost companies, but the county relationship has been more reliable due to our volume. It allowed us to expand collections,” says Allison Lilly Tjaden, assistant director of new initiatives for the University of Maryland’s dining services. In 2017, the educational institution delivered 950 tons of compostable material to the facility. In addition, it grows vegetables served in the dining hall using the compost, and it’s tapped into its relationship with the county to provide an educational tool. “Our students and dining staff tour the facility so everyone on campus can understand composting and how we are reducing our environmental impact and adding nutrition back to the soil,” says Tjaden, who is excited about the expansion. “We know as we continue to find opportunities to collect organic waste that the county can accommodate it, which was not the case in the past,” she adds. The project is expected to be complete by fall 2018 at an expected cost of $5.6 million to $5.8 million.